Mine: A terrific story. Very well acted. Maybe a bit to long. Wonderful production design. The story is fascinating, if largely fictional. 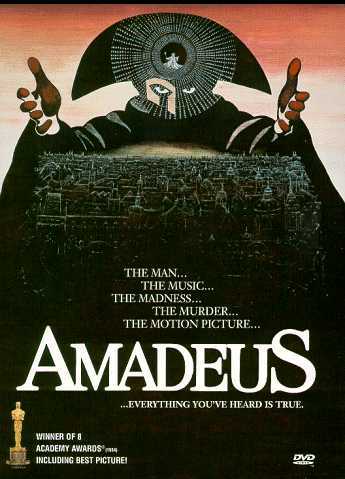 Leonard Maltin/Plot synopsis: Abraham won well-deserved Oscar as composer Salieri, whose music never surpasses mediocrity, while a hedonistic young boor named Mozart expresses musical genius almost without trying! Literate, intelligent, exquisitely filmed (in Prague, by Miroslav Ondricek)... but fatally overlong and missing dramatic fire that distinguished Peter Shaffer's play (Shaffer rethought and rewrote it for the screen). Worth noting: Jones' wonderful performance as musical dilettante Emperor Joseph II. Winner of seven other Oscars, including Best Picture, Director, Screenplay, Art Direction. Panavision.